As the gentrification of Parramore continues, the University of Central Florida Downtown Campus construction is also moving forward and becoming a reality. 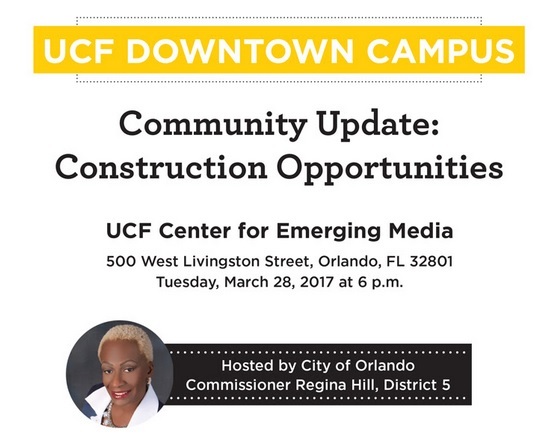 As the first real phase of Creative Village slowly develops, members of the community are invited to join UCF and members of the design and construction teams for an update on the downtown campus. The community meeting will also include information on upcoming contract and bid opportunities. City Commissioner Regina Hill is hosting the meeting as it falls within District 5. 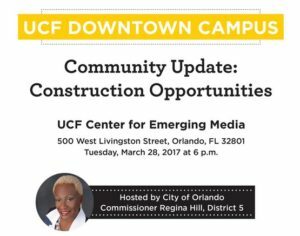 The focus of the meeting seems to be on construction opportunities – since poor and minority residents will continue to be pushed out of their own community in order for UCF to move in, it appears the hope is that some will at least get temporary construction jobs before they go. The previous District 5 Commissioner, Daisy Lynum, made it clear the City of Orlando wanted minorities out of Parramore. The university has pledged to rely on a “transparent process that informs and engages the entire community,” but UCF refuses to acknowledge the ongoing gentrification of the surrounding area and their own role now in the community struggle. A Stop Creative Village movement raised concerns and awareness of the gentrification and displacement of residents due to Mayor Buddy Dyer’s development plans. Unfortunately for local downtown residents from the west side, there’s no stopping UCF at this point. Light refreshments will be served at the meeting for all attendees. For more information, call 407-843-9901.